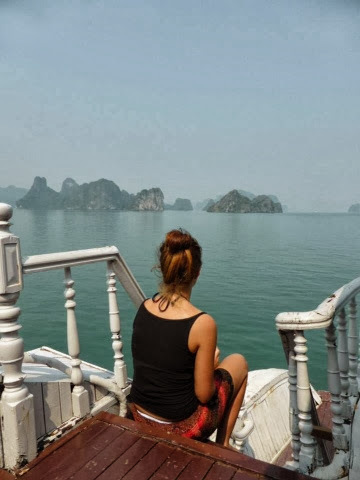 Second to Angkor Wat in Siem Reap, Cambodia, Halong Bay was second on my list of 'if I don't do this while I'm travelling then I will not be happy' list. I'd seen the pictures and the idea of spending a night on a boat somewhere so peaceful was something I knew I would love straight away. At $74 for two days, one night on a superior boat (don't go economy - they're renowned for being unclean with not so good tour guides). 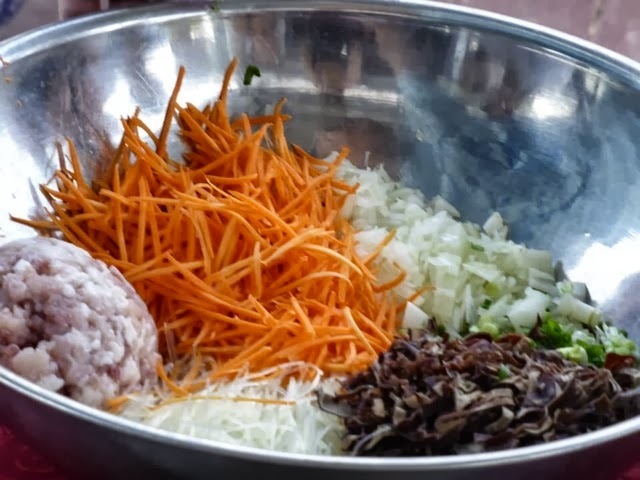 The trip includes a visit of an incredible cave (a second UNESCO site), kayaking around the bay, a trip to a pearl farm and possibly some of the best food I've had during the whole trip! (All the food included and you get A LOT of it) We were picked up from our hostel at 8am and began the three and a bit hour journey to the bay. We've already come to terms with travel in SE Asia - they have poor concept of time; nothing is EVER on time whether it be pick up, arrival, journey duration - they're pretty bloody useless. So it took us four hours in the end with a stop off in the middle - which is always appreciated as there's ALWAYS ice cream. We arrived at the port and waited for our mini boat to take us to the main boat. After five minutes we were boarding our main boat and being seated for lunch. We managed to fit in a quick look around (rather impressed, I have to admit!) and popped our bags in our rooms. The boats offer one triple room and double rooms; we also realised you can fit three in a double room as the rooms are quite small and it would be near impossible so if there's an odd number, be prepared to have one of you share with somebody else as the triple room is snapped up quickly! After lunch we hopped back on our mini boat and set off for the caves and kayaking the bay. By this point, I was flagging a little bit; the previous few days of non-stop travelling and activities had left me tired and in need of a rest. The cave was beautiful and really impressive but I didn't take it all in nearly as much as I should have. After a lot of steps and walking around, we headed back on the boat to the kayaking area of the bay. I paired up with Katie, a kayaking virgin! We had a lot of fun and a near fall-in on her part but it was incredible to kayak around, take in the view and just appreciate the experiences we were fortunate to be having during our trip. After an hour, we headed back to the main boat for an hour of rest time before yet another HUGE meal. Honestly, for a food lover like myself, paying $74 for this boat trip was more than worth it for the meals alone. For our evening meal we had a mixture of fresh salad and vegetables, ingredients to prepare our own fresh spring rolls (using carrots, noodles, lettuce, pork, spring onion and a garlic/chilli oil, all wrapped in rice paper - this is something I absolutely love and I know I will make them all the time once I'm settled in Australia and cooking for myself), breaded white fish, steamed prawns with lime and seasoning, steamed rice and too many other amazing things to remember. We had fresh fruit for dessert again and a few Hanoi beers to wash it all down. 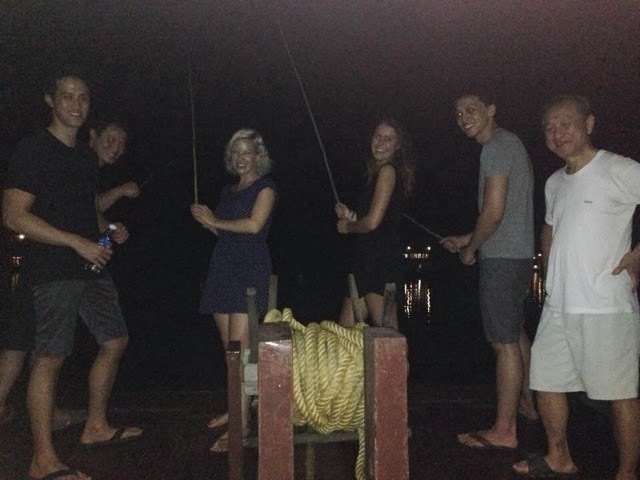 Obviously, on a boat, you have to occupy yourselves in the evening, After dinner we had a little go at squid fishing - something which we were all pretty useless at. Earlier that day a little Vietnamese lady had rowed up to our boat on her teeny tiny boat full of snacks and drinks and sold us a few bottles of vodka. She hadn't charged a great deal but, a warning to you, if the boat staff see you, they will sting you with a service charge per bottle - even for soft drinks! The American boys on our trip bought theirs through their bedroom window and poured it into empty water bottles so avoided the charge - DO THIS. Paying $10 service charge for a bottle of vodka and two bottles of soft drinks is not only annoying but makes it unnecessarily more expensive. Oh, and the vodka will probably be at least a year out of date but we drank it and lived to tell the tale (seriously though, I would love to know how vodka can go out of date- so any of my readers, care to share if you know!). We headed up to the top deck, spirits in hand and as well as teaching each other drinking games, witnessed magic tricks (that are still baffling Katie) and spent a great deal of time discussing the American/English accent, funny words and phrases and mimicking said words/phrases, This is one of the things I love about travelling - you meet so many people from different places and it's always interesting to hear about the differences in accents and lifestyles. Breakfast was distinctly average - toast, eggs/omelette and fruit but I FINALLY had a proper cup of tea; something I had been really missing since being away. Our final morning on the boat allowed us to get a couple of hours of sunbathing in (finally!) and a trip to a pearl farm. Around 12pm we headed back to land and made our way back to Hanoi. 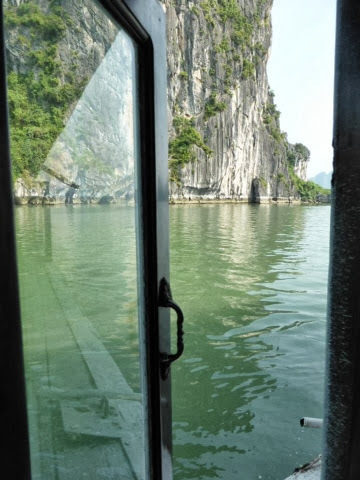 By the time we had got back from Halong Bay it was around 5pm but the others had caught up with us and booked us into a hostel with them - Central Backpackers. 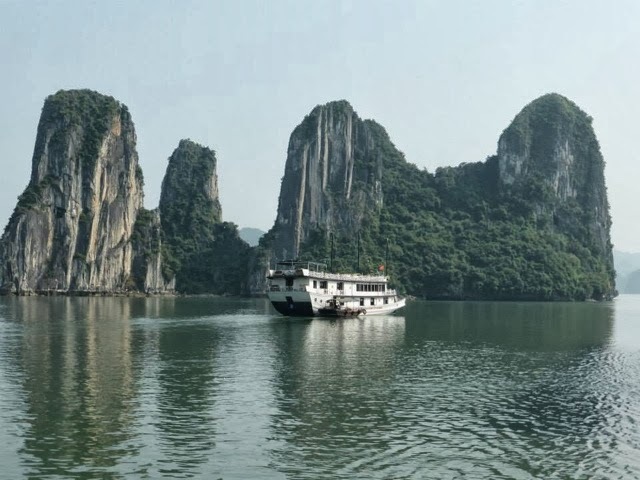 Do Halong Bay, stay at Central Backpackers - there isn't a huge amount of stuff to do in Hanoi but make the most of your time there, even if it's just for the shopping.